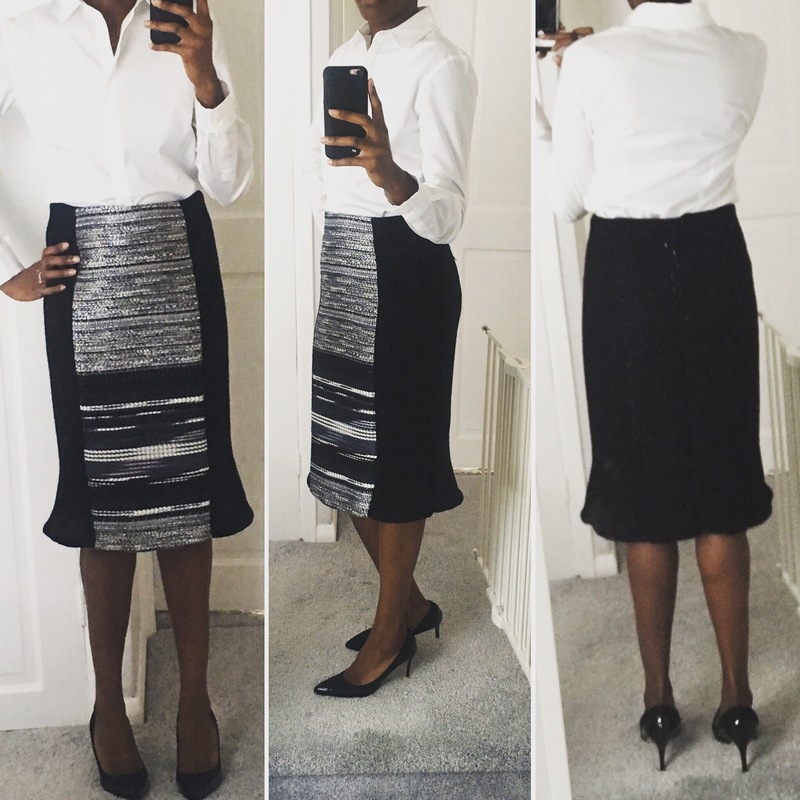 I was looking for a panelled skirt pattern the other day, and as soon as I saw the Etta Skirt by Style Arc Patterns, I knew she was just the sort of thing I wanted. After A recent Paris trip, I’d acquired a little stash of Malhia Kent woven fabrics in awkward/small offcuts, which I’m on a mission to incorporate into my next few projects. For this skirt I used one that’s a silver/metallic mixed with black, teal and grey threads. It’s pretty thick, so I paired it with a fairly thick black boucle wool from Linton Tweeds. Fabric: a combination of wools as described above. Sizing/Alterations: I sewed a size 8. I had reviewed the measurements on the pattern and made a couple of alterations mainly to give me more width in the front waist and less in the back, due to swayback and a persistent post-baby tummy situation. I also lengthened the pattern by 4 inches as I prefer my work skirts to fall below the knee. When I had stitched everything up, I found that the flounce side inserts were too stiff – a combination of the thick wool and the bias bound hem, I think – so I ended up stitching a little tuck/pleat in the middle of each one. The suggested fabrics are much lighter than what I’ve used, but anyway this gave them a nice shape and I’ll have to see how it holds up. Instructions: StyleArc’s instructions seem pretty minimal, I think they are intended for more experienced sewers, but that said, I managed without any difficulty and I don’t think I had to Google anything. There was one part, in dealing with the hem where the straight section of the skirt meets the flounce insert, where the only reason I knew what they were talking about is that Id done something similar on another pattern, but I think you could have worked it out by trial and error. Oh, and the pattern is based on a 3/8″ seam allowance, smaller than the usual 5/8″. With my thick and fairly loosely woven wools, I was nervous about this, so when I cut my fabric I eyeballed extra to give myself a 5/8″ seam allowance. Difficulty: the pattern is rated Medium/Challenging. I think I’d agree, maybe more medium than challenging but I guess it depends on whether you happen to have sewn anything which uses a similar technique to the one they used for the flounce inserts. Would I recommend, or sew it again? : Yep, I would definitely recommend it. In theory I’d like to sew it again, but it’s quite distinctive so I probably wouldn’t have two of these on the go in my work wardrobe at the same time :). I would do one in a lightweight suiting/drapey fabric for spring/summer though and keep this one for autumn/winter. It’s super cosy so I look forward to wearing it once the weather turns. This looks lovely. The fabric you have chosen works really well with the style of the skirt. ← Paris fabric shopping (in 6 hours)..